Student C: Roshi, could you say something about the difference between the mission of Jesus Christ and that of the Buddha? Student C: The missions of Jesus Christ and-- the missions of Jesus Christ and the Buddha? Are they similar? SR: What did-- I don't-- I couldn't follow you. The last part. SR: I don't know Christianity so -- at all, you know, maybe. I studied, you know, very - as a Buddhist. I was not Christian, so my understanding would not be an appropriate good understanding of Christianity, because I am not -- I don't believe in, you know, God or [laughs, laughter] so-- I have no position as a Christian, you know, so I'm afraid to say anything about Christianity because I don't know. But I am just -- as a Buddhist, I want to study our way, and I want to be very critical with Buddhism not with other religion. As we are Buddhist -- if it is difficult for me to believe h is teaching, I must have some doubt, and I must have some criticism about it -- about Buddha's teaching. I don't feel so bad if I criticize Buddhism, as I should criticize myself. But I don't want to criticize other religion which I don't know so well. And if I talk about -- when I start to think about Christianity as a Buddhist, I have big doubt on how Christian people believe in God, you know. I don't understand so well. I can imagine, or I can guess how they believe in God. So I cannot compare Christianity to Buddhism. And, of course some Buddhist-- some teacher, Buddhist teacher, who was-- who was once Christian, you know, can compare Buddhism to Christianity. 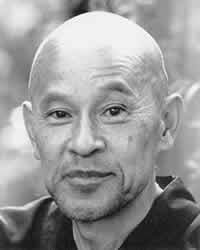 Like Uchiyama Roshi, who lives in Kyoto, he was once a Christian minister, and he converted to Buddhism. So he knows both Christianity and Buddhism. I am sorry, I cannot [laughs], you know, answer. Student C: I was thinking more of the figure of Christ than Christianity. When I said that, I was thinking more of the figure of Christ or-- rather than Christianity. SR: Excuse me, I don't want to say anything about Christianity, you know. I am completely blind [laughs, laughter]. DC note: I didn't edit out how hard it was for Suzuki to understand the question because I wanted to show that - that sort of difficulty is found throughout the questions and answers in this archive. Frequently we can see that his answer takes off from one or more key words in the question. I can easily relate to that. I can say almost anything I want in Japanese and getting there in Indonesian but I have a hard time understanding what people say to me. I remember often thinking back then when I was listening to Suzuki answer questions that he wasn't really answering the question asked but that it was a really good answer anyway. I thought that it didn't matter that he didn't quite get the question because mainly he wanted to tell people what he thought they should hear rather than what they wanted to hear or hear about.